There’s just something so timeless and cosy about the Country look for homes don’t you think?! 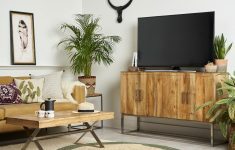 Whether your style is about the understated chic take on this trend using neutrals of natural wooden textures together with pale grey, white and cream colours – or you love to live colourfully with pastels and shades of each season – the country chic interiors style is undeniably popular and homely. We’re exploring beautiful pieces to create your dream home with the vast collection of brands at Prezola, our go-to wedding gift registry! 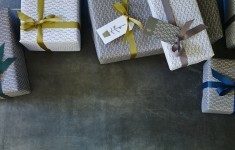 At Prezola you can can shop from a huge range of stylish products to create a beautiful home and life together, and you can choose their genius ‘group gifting’ option for pieces you just have to have which are a higher price point. This means that an entire group of your family and friends can come together to get your dream pieces. Speaking of dream pieces, if you’re wanting to create a timeless Country Chic look for your home, we have picked a few things from their current collection that would be perfect! For example, the lovely pale grey Provence set of drawers and matching Provence console table by The White Company at Prezola. This is a great brand to consider for this style and we loved their beautiful candles and refined Artisan Stoneware Tableware collection in a crisp white. Other brands to look out for to create the sweet homespun country style with an elegant edge would be Sophie Allport, OKA, Graham and Green – have you seen the Hetty Hair Lamp! 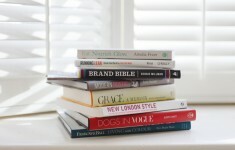 Soho Home and The Linen Works! We loved so many pieces from the Linen Works collection at Prezola, especially their Parisian Blue tablecloth! 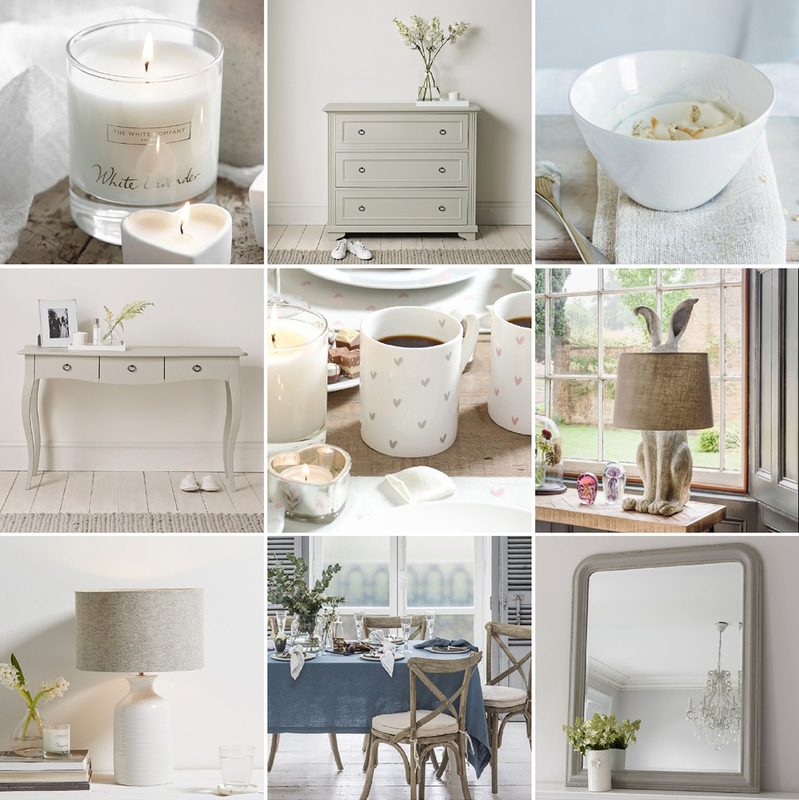 Featured Products: White Lavender Candle by The White Company at Prezola . Provence Set of Drawers by The White Company at Prezola . 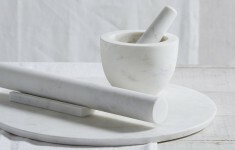 Artisan Stoneware Cereal Bowl by The White Company at Prezola . Provence Console Table in Pale Grey by The White Company at Prezola . Pink Hearts Mug by Sophie Allport at Prezola + Grey Hearts Mug by Sophie Allport at Prezola . Hetty Hair Lamp by Graham and Green at Prezola . Ceramic Bottle Lamp by The White Company at Prezola . Mitered Hem Tablecloth in Parisian Blue by The Linen Works at Prezola . Hampshire Grey Mirror by Brissi at Prezola . 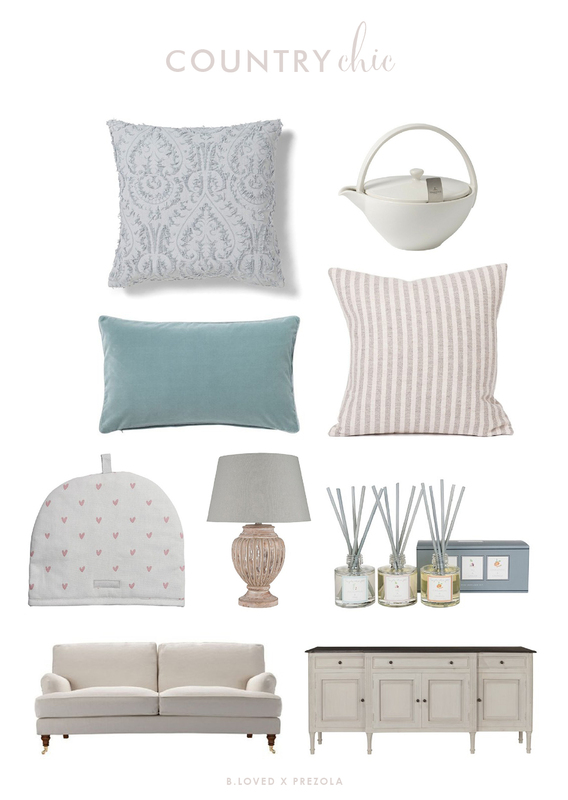 Here are a few pieces that would make the loveliest lounge or sitting room for your country chic inspired home! The Bluebell Sofa by Sofa.com at Prezola is one of my favourites and it compliments various styles – and certainly this provincial flair. Scatter cushions in different textures and gentle colour tones such as these three lovely examples below – the beautiful blue patterned Chrysie Cushion by Soho Home at Prezola, the luxe velvet Gainsborough Blue Cushion by OKA at Prezola, and finally the amazing Harbour Stripe Cushion in Mushroom and Ecru by Tori Murphy at Prezola. Featured Products: Chrysie Cushion by Soho Home at Prezola . Four Person Teapot with Filer by Villeroy and Boch at Prezola . Plain Velvet Gainsborough Blue Cushion by OKA at Prezola . Harbour Stripe Cushion in Mushroom and Ecru by Tori Murphy at Prezola . Hearts Tea Cosy by Sophie Allpost at Prezola . Antique Grey Mango Wood Table Lamp with Shade by LightStore at Prezola . Diffuser Set by Sophie Allport at Prezola . The Bluebell Sofa in Taupe Brushed Linen Cotton by Sofa.com at Prezola . Explore the entire collection and register for your wedding registry at Prezola today! Don’t for get that if you’re getting married before March 2019 you sign up to Prezola for a FREE Soho Home Champagne set worth £100!